The debut album. From a mystery band of "outlaws". Sounds like Lynyrd Skynyrd, Status Quo, Blackberry Smoke , Waylon Jennings, The Georgia Satellites all got together to make a good ol' fashioned country record ... and "rock" a little bit. "For Ol' Times Sake", qualifies in that department. Witty, charming and heartfelt, guaranteed to make you smile. an Englishman who has lived in the heart of the southern U.S. for a long time and knows all about three chords and the truth. 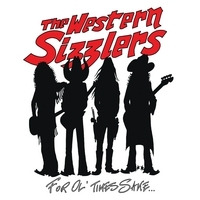 Jennings called on some old friends to help him record the album and they accidentally became "The Western Sizzlers". Nobody knows who they are but they sure can play.